Some say the world will end in fire, Some say in ice. From what I’ve tasted of desire I side with those who favor fire. But if I had to perish twice, 5 I think I know enough of hate To say that for destruction ice Is also great And would suffice. Notice the “5” this is a marker to assist readers writers as they discuss poetry. It gives them something to quickly anchor themselves to. Be sure to look up any words you don’t know. Put into your own words lines or entire stanzas from the poem. Don’t be fooled by a short poem. Sometimes those short poems are full of ideas. Some say the world will end in fire, Some say in ice. From what I’ve tasted of desire I side with those who favor fire. To Paraphrase: The speaker believes fire and desire are related. From previous experience with desire, the author thinks the world will end in fire. 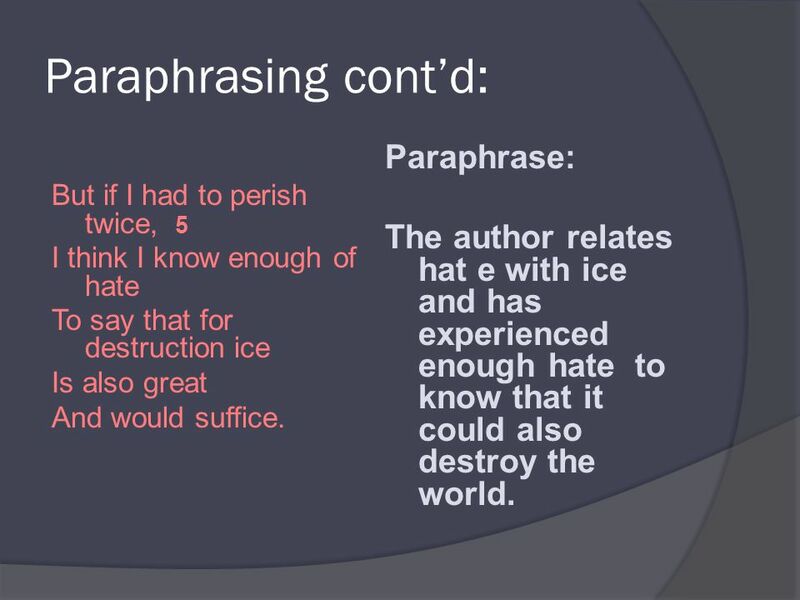 6 Paraphrasing cont’d: Paraphrase: The author relates hat e with ice and has experienced enough hate to know that it could also destroy the world. But if I had to perish twice, 5 I think I know enough of hate To say that for destruction ice Is also great And would suffice. 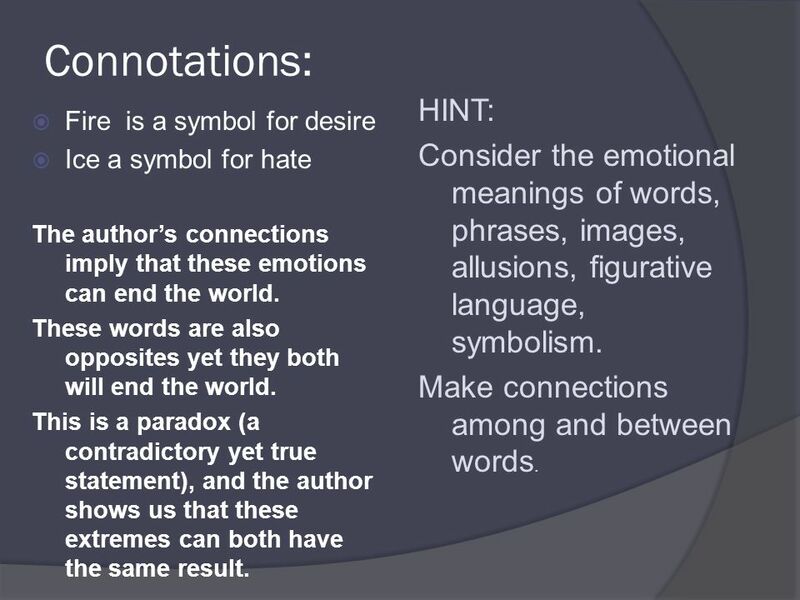 7 Connotations: HINT: Consider the emotional meanings of words, phrases, images, allusions, figurative language, symbolism. 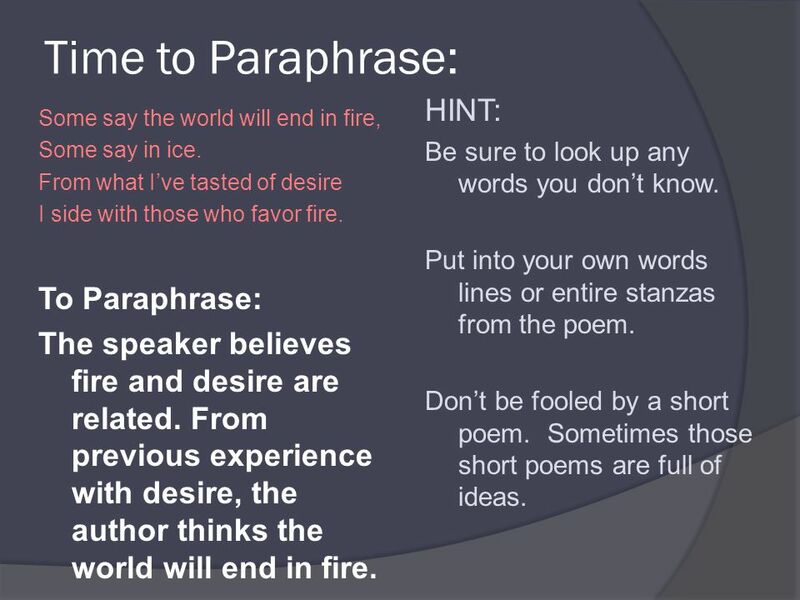 Make connections among and between words. 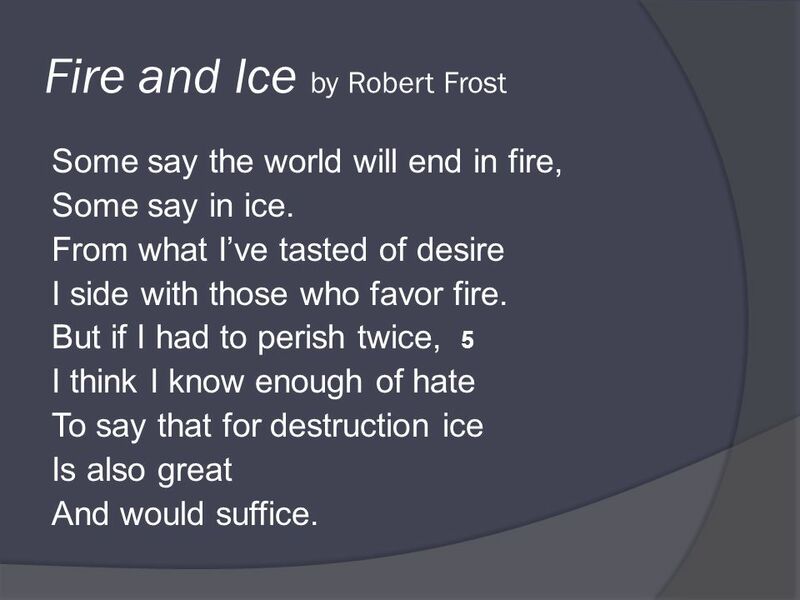 Fire is a symbol for desire Ice a symbol for hate The author’s connections imply that these emotions can end the world. These words are also opposites yet they both will end the world. This is a paradox (a contradictory yet true statement), and the author shows us that these extremes can both have the same result. “suffice” The last word of the last line seems understated compared to the topic of the world ending. The speaker sounds “matter of fact” about the causes of the ending. 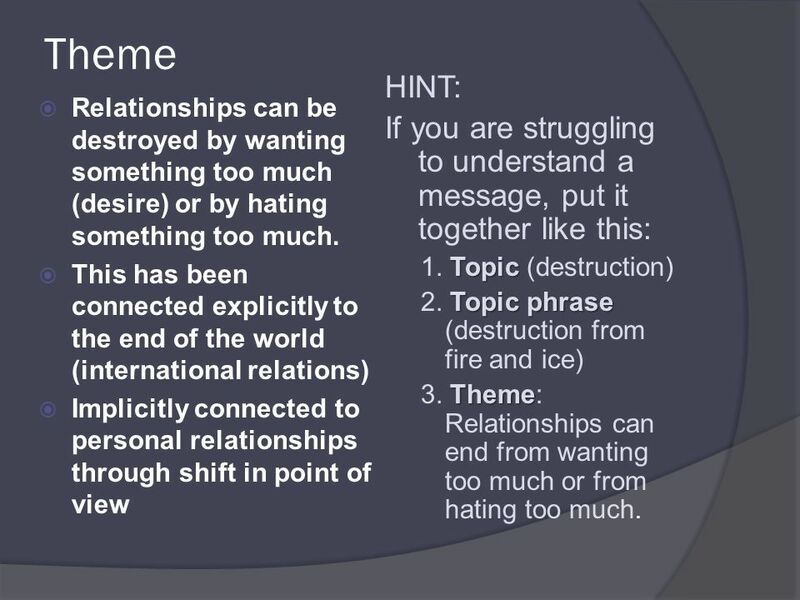 HINT: Look for sarcasm, understatement, and hyperbole to determine emotional connections to topics. 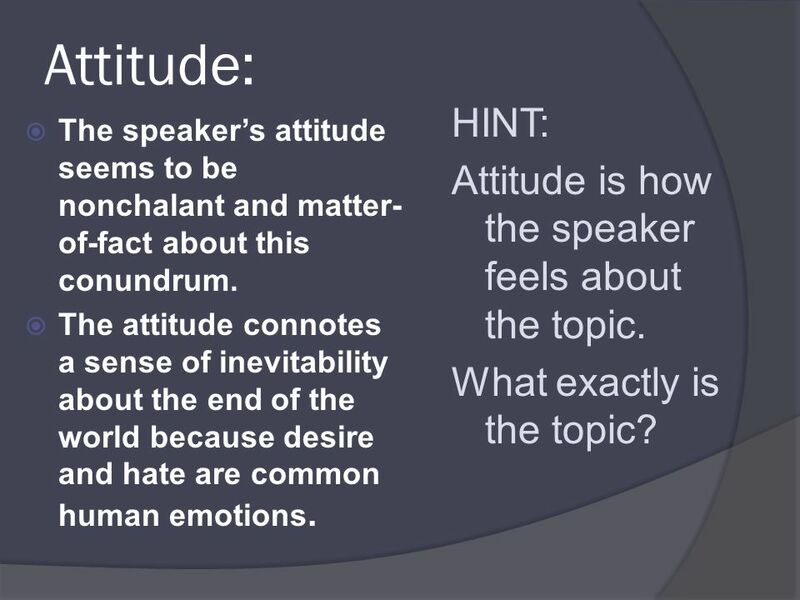 9 Attitude: HINT: Attitude is how the speaker feels about the topic. What exactly is the topic? The speaker’s attitude seems to be nonchalant and matter-of-fact about this conundrum. The attitude connotes a sense of inevitability about the end of the world because desire and hate are common human emotions. 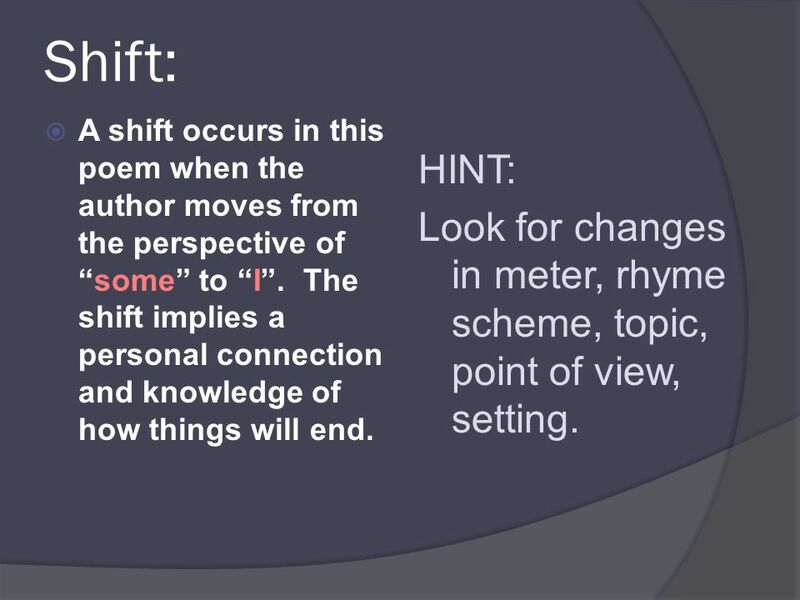 10 Shift: A shift occurs in this poem when the author moves from the perspective of “some” to “I”. The shift implies a personal connection and knowledge of how things will end. 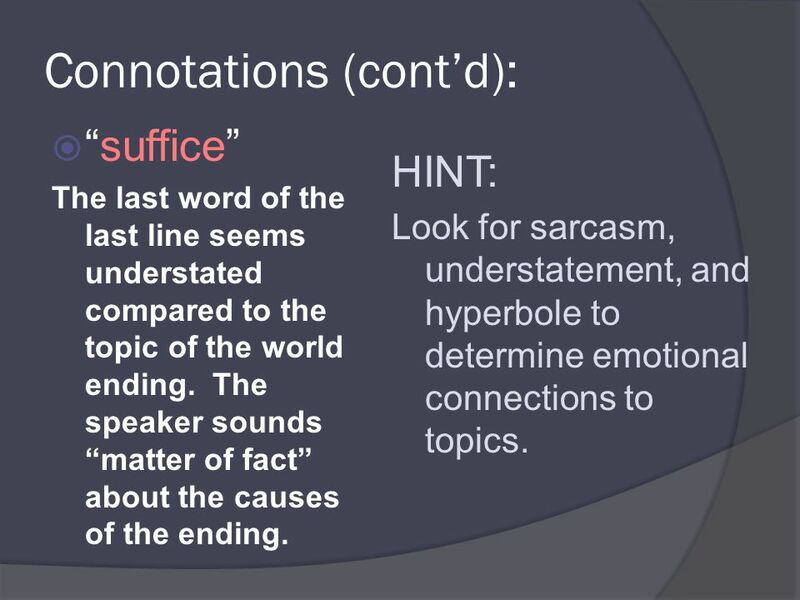 HINT: Look for changes in meter, rhyme scheme, topic, point of view, setting. Construed as destructive Does the title really imply the end of the world? Or the end of something else—maybe a relationship? 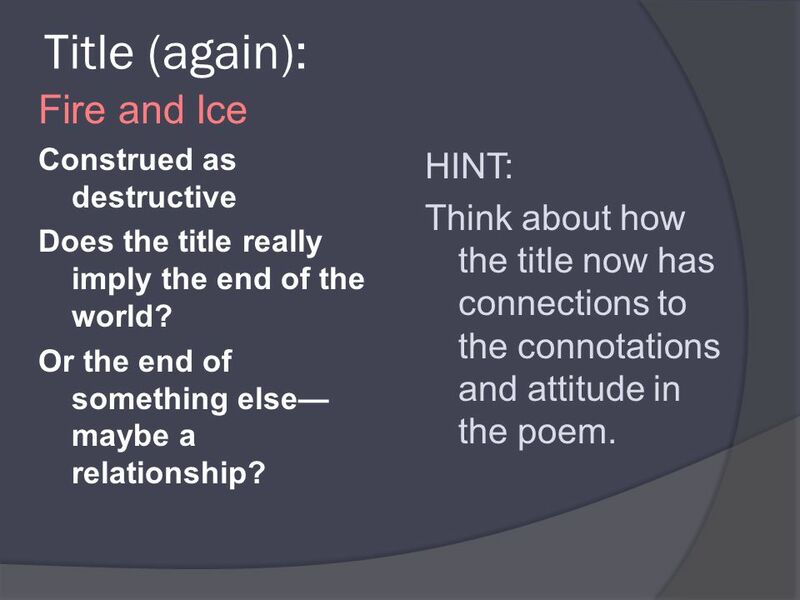 HINT: Think about how the title now has connections to the connotations and attitude in the poem. 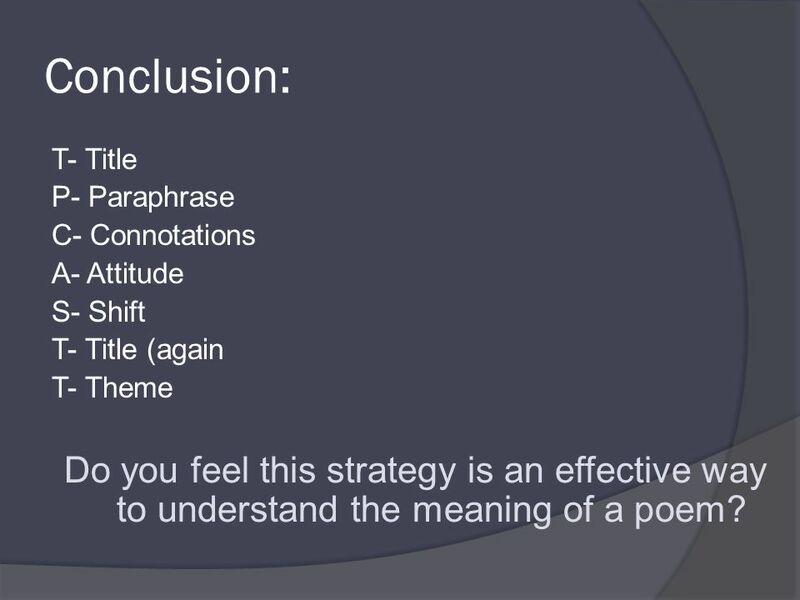 13 Conclusion: T- Title P- Paraphrase C- Connotations A- Attitude S- Shift T- Title (again T- Theme Do you feel this strategy is an effective way to understand the meaning of a poem? 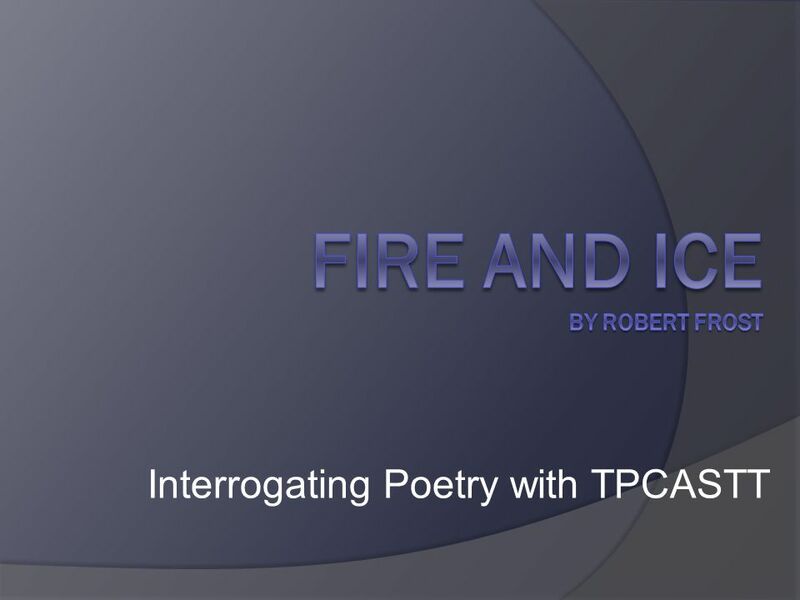 Download ppt "Fire and Ice by Robert Frost"
Question and Answer Samples and Techniques. What is TPCASTT? 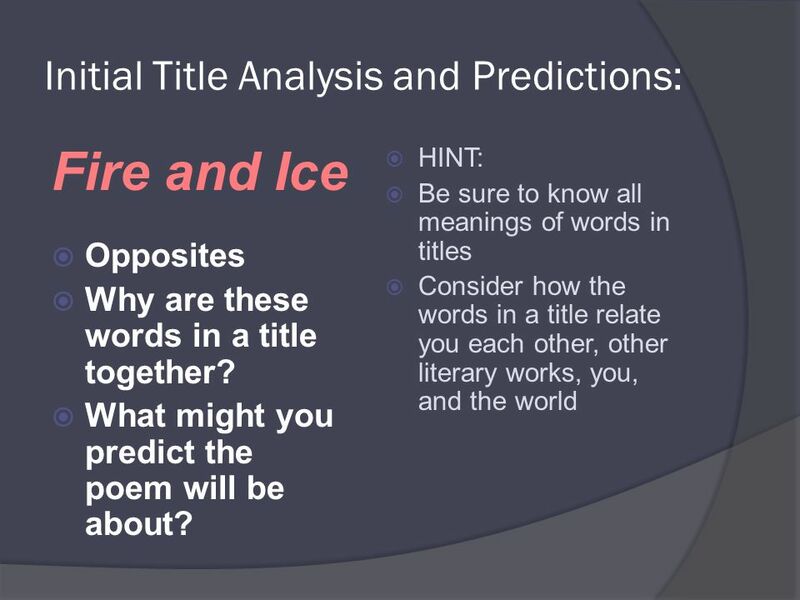 It is a strategy used to analyze and understand poetry. Each letter represents (or stands. Elements of Poetry Ms. Barrow. You’re on the Precipice… Write to someone who cannot see what you see. Use vivid images to describe what you see, how you feel, the smell and taste of. Fire and Ice Some say the world will end in fire, Some say in ice. From what I've tasted of desire I hold with those who favor fire. But if it had to perish. W RITING A P OETRY A NALYSIS. A LLEGORY  Definition: A narrative or description that has a second meaning beneath the surface  The underlying meaning. English Steps Mastery Test 5  No talking. No iPods.  Turn into the tray when finished and pick up the Chapter 6 notes handout to work on until. 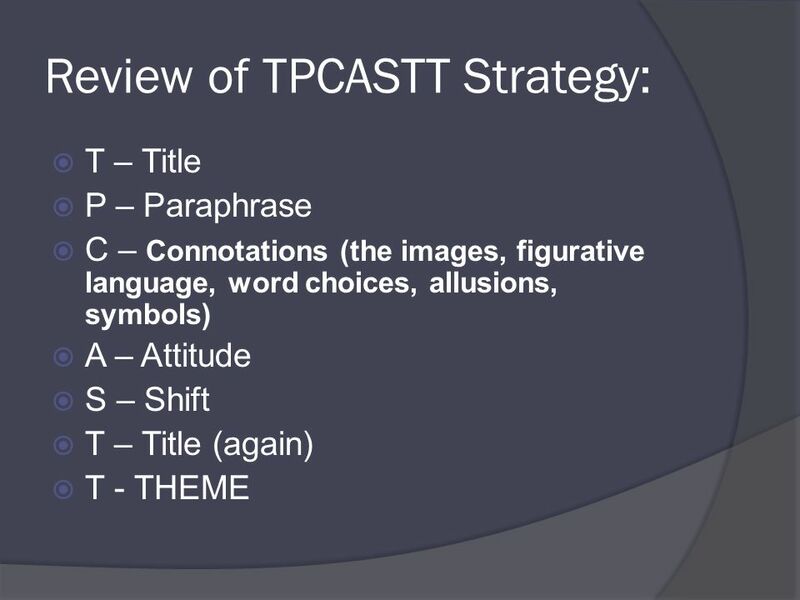 How to Analyze a Poem: One Strategy: TP-CASTT. T: Title Consider the title. Consider the title. What ideas/images does it evoke?What ideas/images does.